Most Charlie Kaufman movies are tricky to write about because they’re too certifiably insane to summarize—just trying to explain what happens in Being John Malkovich, Adaptation, or Synecdoche, New York can exhaust a hefty word count. Anomalisa, by contrast, is relatively simple, at least in concept. But that concept, which originated in a play Kaufman wrote for composer Carter Burwell’s Theater Of The New Ear some years ago, is best experienced tabula rasa, allowing its disorienting strangeness to sneak up on you. The film’s marketing campaign has been kept deliberately, even studiously vague, and violating its air of mundane mystery would arguably be doing potential viewers a disservice. If you’re a Kaufman fan, you definitely want to see Anomalisa, and are hereby advised to put off reading anything more about it (including the paragraphs that follow) until you do. Only the certifiably damaged—meaning Kaufman agnostics and/or people who habitually read the last chapter of a book first—should forge ahead now. In truth, there is no big twist in this movie… but there’s also a reason why such a small-scale, intimate story, set almost entirely in a Cincinnati hotel, was shot using stop-motion animation rather than actors. (Kaufman co-directed the film with Duke Johnson, who previously animated the stop-motion episode of Community.) At first, one’s attention is drawn to gorgeous visual details, like the rain-spattered windows of the taxi hailed at the airport by protagonist Michael Stone (voice of David Thewlis), who’s just arrived in Cincinnati to give a business lecture about superior customer service. But as Michael interacts with the cabbie, the hotel desk clerk, the bellhop, and eventually an ex-girlfriend with whom he ineptly tries to reconnect while he’s in town, the light gradually dawns: Every character who isn’t Michael shares the same eyes, and they all, male and female, speak with the same flat voice (Tom Noonan). Which is why Michael is instantly, overpoweringly drawn to a fellow hotel guest named Lisa, whose puppet has her own distinct facial features and who speaks in the gloriously non-Noonan voice of Jennifer Jason Leigh. 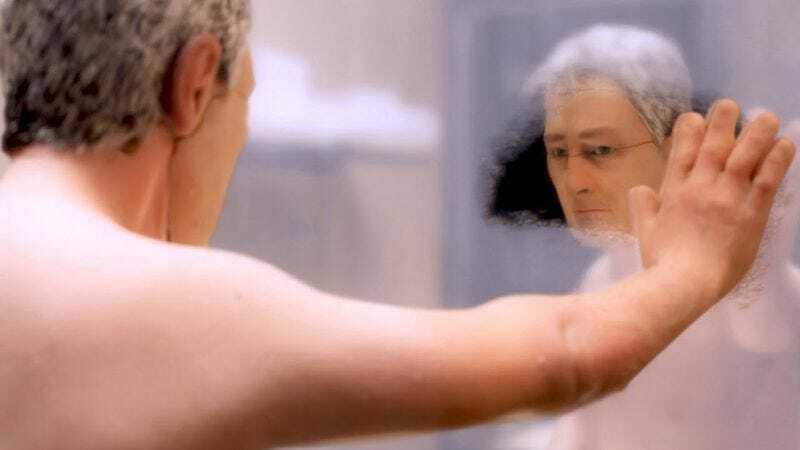 Like Synecdoche, which was partially inspired by the Cotard delusion (hence the name of Philip Seymour Hoffman’s character, Caden Cotard), Anomalisa derives its central metaphor from a real-life, incredibly bizarre neurological syndrome. Here, the hotel where Michael and Lisa stay is called the Fregoli—Kaufman’s winking reference to the Fregoli delusion, in which the afflicted party becomes convinced that numerous people in his/her life are secretly the same individual in disguise. Anomalisa makes literal this paranoid idea in order to explore the intense “you and me against the world” feeling that someone who’s stuck in a rut can experience upon making a random connection with another human being. Lisa, who works in customer service and drove four hours with her friend Emily (Noonan) to see Michael speak, is shy and slightly disfigured and utterly lacking in self-esteem, yet Michael is prepared to leave his wife (Noonan) and abandon his young son (Noonan) after knowing her for only a few hours. Is there any basis in reality for his conviction that he and Lisa share something special and unique? Is she, in fact, anomalous? By Kaufman’s high standards, the answer to those questions is unusually predictable; many will guess the resolution of Michael and Lisa’s affair well in advance. That scarcely matters, though, given how beautifully distinctive Anomalisa is from moment to moment. Kaufman and Johnson have designed the puppets with numerous imperfections, both human (bodies tend to be flabby, and are, let’s say, anatomically correct) and mechanical (no effort has been made to erase the seams where separate face plates connect), which makes the movie almost unbearably poignant at some times and downright nightmarish at others. And Kaufman’s gift for absurdist comedy finds numerous outlets in the minor annoyances and indignities Michael suffers: a garrulous cabbie (Noonan) extolling the wonders of Cincinnati’s chili and zoo; indecipherable icons on his hotel room’s phone; a visit to a 24-hour “toy store” that’s not exactly geared toward children. Most of all, Anomalisa, in common with virtually every film Kaufman has written, struggles to make peace with the knowledge that we are all fundamentally alone. That’s the biggest spoiler of them all.